Platform based on metal nanostructures that allows the lab to dramatically enhance the radiative properties of emitters and other materials. Illustration by Gleb Akselrod. 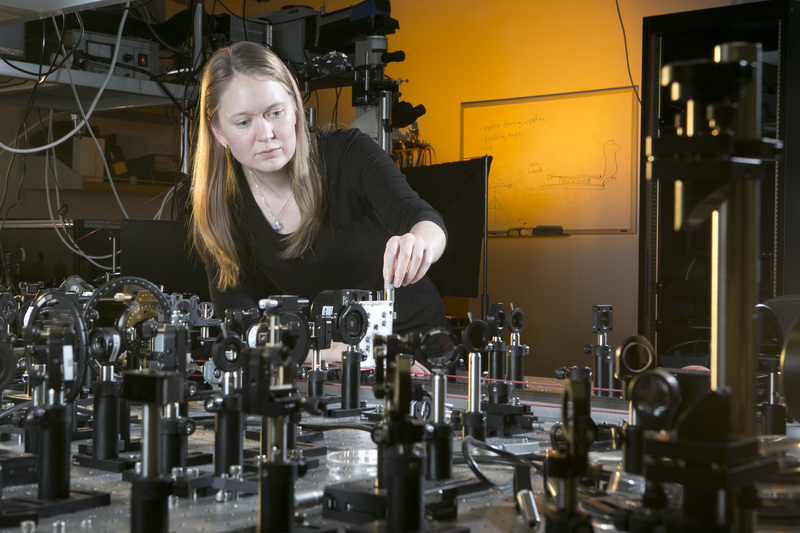 Recent winner of the esteemed Cottrell Scholar and Maria Goeppert Mayer Awards, as well as a “triple crown” of Young Investigator Awards from the Air Force, Army and Navy, Professor Maiken H. Mikkelsen uses optics to tailor material properties to make them brighter and faster than found naturally. As Professor Mikkelsen teaches my ECE 340: Optics and Photonics course, I had the wonderful opportunity to ask her more about her research and experience at the Photonics Asia conference held in China in October 2016. She is a distinguished researcher who has received numerous accolades and has various publications on her research in Science, Nature Photonics and Nature Physics, to name a few. Professor Mikkelsen enjoys hiking, gardening, playing tennis and traveling in her free time. Below is an edited transcript of the interview. Q: What sparked your interest in optics and photonics? I was really excited about doing hands-on research where you could actually probe nanoscale and quantum phenomena from optical experiments. I started out looking into condensed matter and quantum information science and currently observe delicately designed nanostructures. Optics is, to some extent, a tool to modify the properties of materials. Q: What does your lab do and how do students contribute? During the last few years, my students and I have been structuring materials on the nanoscale to modify the local electromagnetic environment, which makes these materials behave in new ways. Students play a key role in all aspects of the research, from nanofabrication, to performing the optical experiments and presenting the results to the scientific community at conferences all over the world. The lab uses tiny metal structures to concentrate the incoming electromagnetic field of light to very small volumes—a research area known as plasmonics. Placing other materials in the near field of this modified environment causes electrons to behave completely differently. By controlling how these electrons behave and modifying the geometry of the material, we can gain a deeper understanding of the light-matter interactions. By combining these techniques with our optical experiments, we’re able to show modifications to material properties that are much stronger than have been seen before. It’s been very exciting! Q: And this research is what you presented at the Photonics Asia conference? Yes. With this knowledge, we can enhance the properties of materials significantly which in the future could lead to ultra-fast and much better LEDs, more efficient photodetectors, or more efficient solar cells and sensors. In Beijing China, I gave an overview of this research at the leading meeting for the photonics and optics industries in Asia, as well as at several other conferences and universities. It was very fulfilling to see how research I do in a dark lab actually gets noticed around the world and it is always deeply inspiring to learn about recent research breakthroughs from other research groups. Q: What is the main purpose of trying to find these improved materials? I am motivated by furthering our fundamental understanding, such as how do light and matter interact when we get to really small scales and how can this interaction be leveraged to achieve useful properties. I believe you often achieve the biggest technological breakthroughs when you’re not trying to solve one particular problem, but creating new materials that could lay the groundwork for a wide range of new technologies. For example, semiconductor materials, with a set of properties that are found naturally, are the cornerstone of most modern technologies. But if you imagine that you now have an entirely new set of building blocks with tailored properties instead, they could revolutionize a lot of different technologies down the road. By improving or completely changing the fabrication technique of these light-matter interactions, new properties begin to emerge. Generally, there’s always a big desire for having something that’s lighter, smaller, more efficient and more flexible. One of the applications we’re targeting with this research is ultrafast LEDs. While future devices might not use this exact approach, the underlying physics will be crucial. About a year ago, Facebook contacted me andwere interested in utilizing our research for detectors that could be ultrafast and detect signals from a wide range of incidence angles. This has led to a fruitful collaboration and is one example of how fundamental research can have applications in a wide range of areas—some that you may not even have imagined when you started! Q: You won the Cottrell Scholar Award and the 2017 Maria Goeppert Mayer Award earlier this year! Congratulations! Do you think these awards changed your life, and if so, in what ways? Receiving the Maria Mayer award was a great honor; it is given to only one early-career physicist a year in the entire world, so I was thrilled when I received that. It was also very nice to get emails from all of my old colleagues and friends congratulating me when they received the notice from the American Physical Societies listservs. 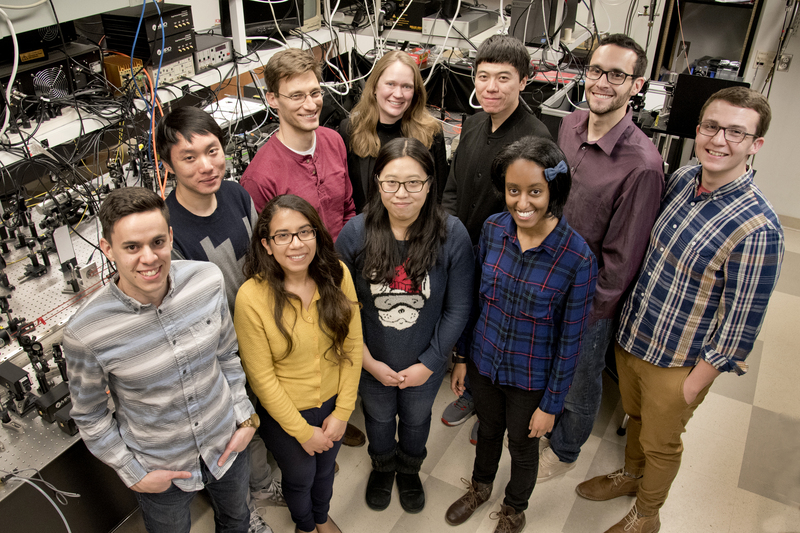 The Cottrell Scholar Award of $100,000 is given to several young physics and chemistry faculty to support both research and educational activities. The scholarship gives winners the full academic freedom to explore and pursue whatever they find interesting and also creates a community with young professors in physics and chemistry across the country to explore and exchange ideas for innovative teaching techniques. Q: What would be your advice to young researchers still trying to decide a career path for themselves or those interested in optics and photonics? What really helped me was starting to do undergraduate research. I listened to talks by different faculty, asked them to do undergraduate research, and worked on a volunteer basis in their labs. I think that’s really a great way to see if you’re interested in research—use the amazing opportunities both at Duke and around the country. Doing research requires a lot of patience, but I think no two days are the same; there’s always a lot of creativity involved while troubleshooting new problems. After all, if it was easy or if we knew how to do it, it would have already been done. But it hasn’t, so we have to figure it out—I think that is a lot of fun. Doing internships in optics and photonics companies is also another option to learn more about research and development in the industry. Get as many experiences as possible and give things a chance!